Public health marketers trying to reach multicultural audiences need to take a mobile-first approach. 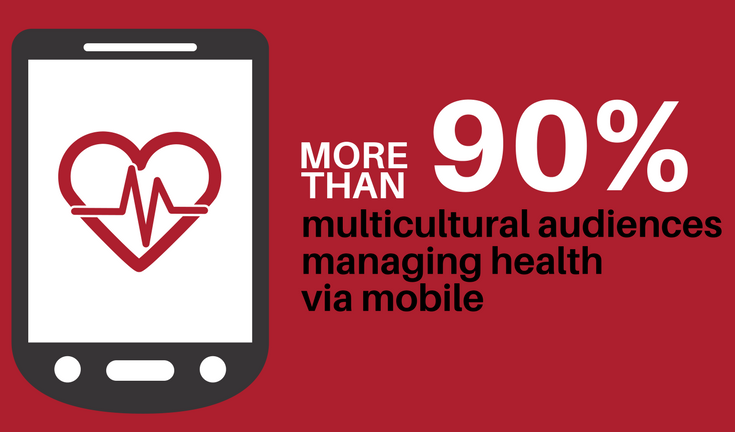 Multicultural audiences tend to have larger out-of-pocket health expenses, delay seeking help from medical professionals and are more apt to look to mobile devices to manage their health. Budget constraints need to be addressed and taken into consideration in order to help multicultural audiences make positive health choices, especially Hispanics. Hispanics (76%) and African Americans (67%) were more likely than whites (59%) to say that budget at least sometimes limited their ability to make healthy choices. Hispanics (67%) and African Americans (67%) were also more likely than whites (52%) to say they sometimes avoided seeking medical help because of the cost. Health educational campaigns need to be mobile-optimized to reach multicultural audiences. 94% of Hispanics and 93% of African American respondents reported using mobile phones to help achieve their health goals compared to 88% Whites. 58% have used their phones to research information about a health issue. Hispanics (59%) and African American (61%) were more likely to use their phone to find health information than whites (56%). Hispanics (46%) and African Americans (45%) were more likely than whites (39%) to read a blog for health info. Health app usage is high across ethnic groups at 57%. Hispanics (61%) and African American (60%) over-index on the use of health apps. Multicultural audiences are ready to embrace using mobile to better manage their health, including telemedicine, text health messages. All groups were interested in telemedicine with 78% feeling it would be at least somewhat useful to consult a doctor via video chat, text or call. More Hispanics (83%) and African American (82%) than whites (75%) felt it would be somewhat useful. More Hispanics (78%) and African Americans (71%) versus whites (62%) felt it would be at least somewhat helpful to receive tips and reminders via text message for a health condition they care about. Hispanics would find higher quality Spanish language information at 66% and apps at 57% at least somewhat useful. Social Lens Research partnered with MocoSpace, a top mobile internet social network platform to conduct the study on the health needs of multicultural communities and the ways they use their cell phones to meet them. The survey had 1,750 completes, and the respondents were 44% White, 32% African-American, and 18% Hispanic. The MocoSpace community is a highly diverse, national and mobile dominant user community. Please contact info@sociallensresearch for more information about the study.